The Swatch GS124 Color The Sky is primarily a kids watch from Swatch Watch. 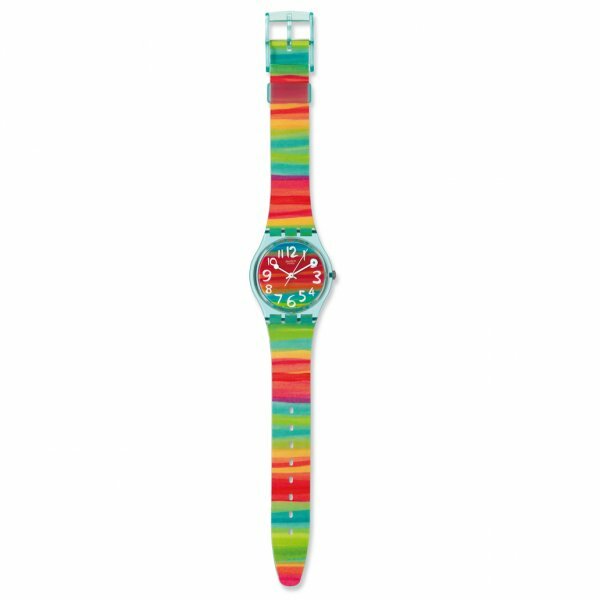 The GS124 is flowing with all the vibrant colours of the rainbow, from strap to dial. The Casing of this swatch watch has a transparent blue casing, the strap has a glossy finish on the outside but where the strap touches your wrist you are greeted with a soft touch coating for improved comfort. All Swatch Watches are powered by the reputable Swiss Movement and come with a 2 Year Manufacturer Warranty, thanks to Tic Watches being official stockists.